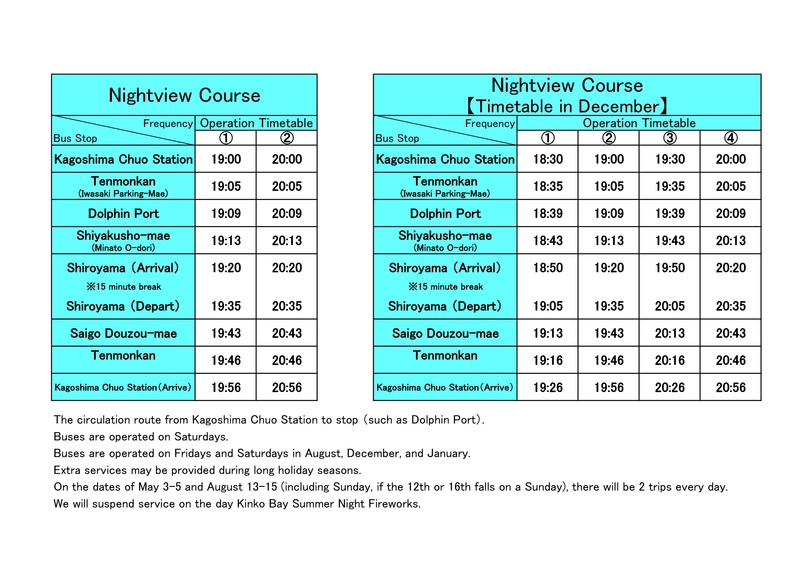 This tour will take you to the main sightseeing spots in Kagoshima City (Daily Service Course and Night View Course). You can enjoy sightseeing at your own pace as you can begin your trip, and finish, from any of the bus stops. Ideal for sightseeing with their comfortable wooden interiors, wide windows, and observation seats in the last cars. The new-type vehicles provide even better views with the seats installed at a 5 degree angle toward the windows. A flat rate of 190 yen for all the courses (100 yen for children under elementary school age). Please put money in the box. You can also use the Rapica IC Card and One-day Pass (Adults 600 yen / Children under elementary school age 300 yen) . 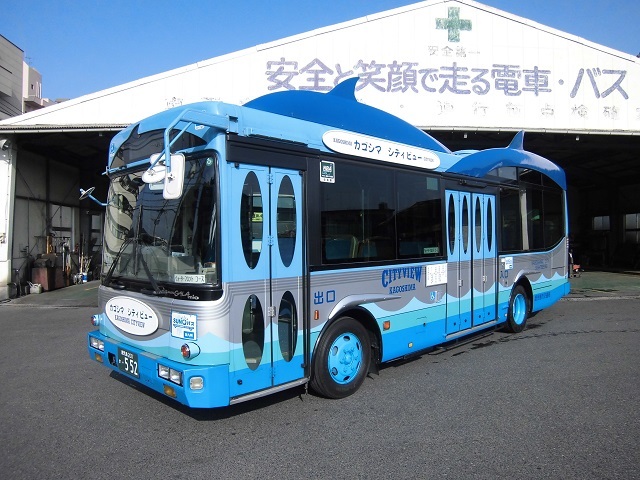 There is a blue bus with images of dolphins and the sea, and a bus that resembles an old tram operating. Buses are operated on Saturdays. Buses are operated on Fridays and Saturdays in August, December, and January. Extra services may be provided during long holiday seasons. Please check our website for information. The bus stopping location differs depending on the course. Please check the listed bus schedule displayed at each bus stop. One-day passenger tickets are ideal for tours and sightseeing, as they can be used any number of times throughout the day on trams and city buses (all lines) and the City View. Please purchase passenger tickets on the City View, trams, buses or ticket sales offices. The one-day passenger ticket is accompanied with a passport that offers discounts for admission fees of tourist facilities. Please note that operations may be moved to different vehicles due to inspections, maintenance, large numbers of customers etc. Please note that there may be delays due to road conditions. Areas of operation routes are subject to change when firework displays, the Ohara Festival and other events are held. 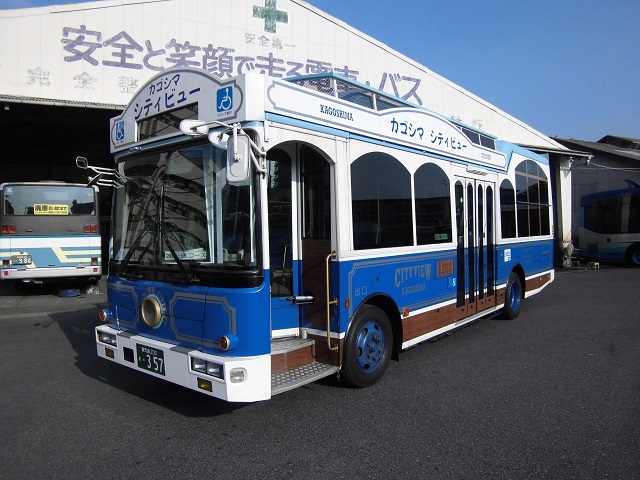 New sightseeing buses are available for viewing around the west part of Sakurajima. Departing and arriving at Sakurajima Port, you can enjoy the great nature and sightseeing spots of Sakurajima– such as Akamizu Observation Park (featuring a monument dedicated to the legendary all-night concert by the Kagoshima-native singer, Nagabuchi Tsuyoshi), Yunohira Observation Point (located at 373 metres above sea level; it is the nearest observation spot to Sakurajima's crater and commands views of Kinko Bay and Kagoshima City's urban area). the "Cute" universal travel pass among city buses, city trams and a ferry, can also be used for the courses. There are 18 seats with the maximum capacity of about 30 people (14 seats when carrying wheelchairs). You may not be able to ride the bus you wish when the bus reaches full capacity. The tour may be conducted using different vehicles due to inspection, maintenance, or busy times. It takes approximately 15 minutes from Sakurajima Ferry Terminal to Sakurajima. 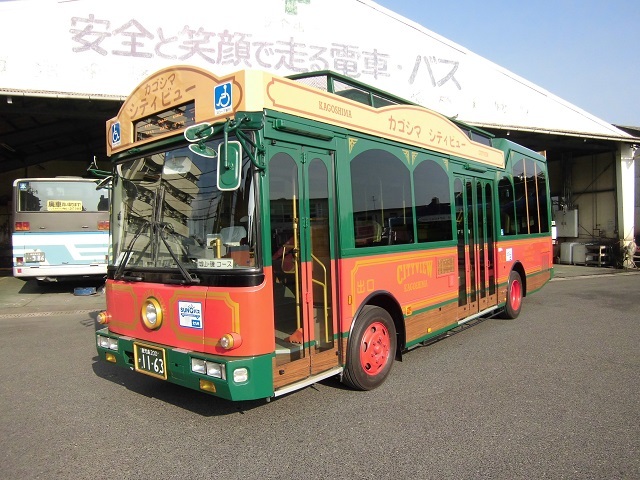 ・1 minute walk from "Suizokukan-mae" bus stop on the Kagoshima City View bus line. 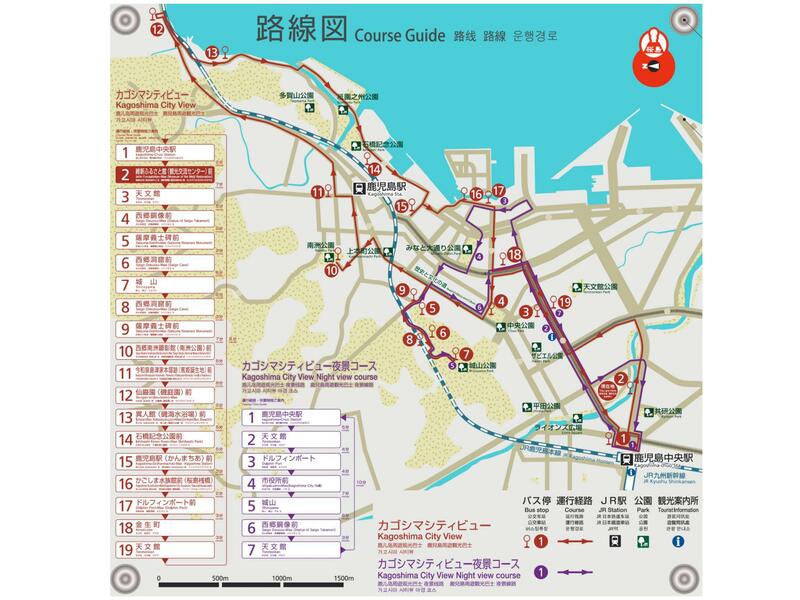 ・1 minute walk from "Suizokukan-mae (Sakurajima Sanbashi)" bus stop on city bus lines. ・5 minute walk from "Suizokukan-guchi" tram stop on city tram lines.